The loyalties of a close-knit Italian family living in England are tested by the complicated feelings of two members for partners outside their circle and the increasingly tense atmosphere heralding World War II. Although the Trombetta clan has lived in London for more than 60 years, its allegiance to home—Lazio, Italy—runs deep, and as the story opens in 1937, several family members are espousing the nationalist policies developed by the country's leader, Mussolini. This unusual immigrant perspective lends originality to British novelist Love's U.S. debut, a period romance built on several layers of love stories. 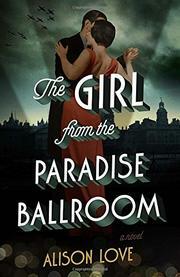 The eponymous girl from the ballroom is Olivia Johnson, whose path crosses that of promising singer Antonio Trombetta at the Paradise Ballroom at a crucial moment in the young woman's life. A dancer for hire, Olivia has escaped from a sad home through her talent for the tango, and Antonio is one of few who know what price she has paid. Although Antonio has a wife and baby son and Olivia makes an impressive surprise marriage to wealthy Bernard Rodway, the connection between the two outsiders is intensified by the difficulties of the ensuing years. And then war overtakes them, bringing "enemy aliens" status to Italians as well as Germans living in Britain. Love's research into the suffering of less-well-documented wartime figures and the messiness of the postwar period lends credible sadness to her narrative, underpinning both the central love story and other affairs of the heart. Dodging many predictabilities, the story reaches an appealing conclusion in 1947, with mature choices for its mingled Italian and British cast. In keeping with her name, Love delivers a satisfying romantic tale enhanced by its bittersweet aftertaste.